24 | April | 2014 | Andrea Works . . . Knock, knock! Who’s there? Nutritionists and foodies having apoplectic meltdowns! Oh, yes, it happened. 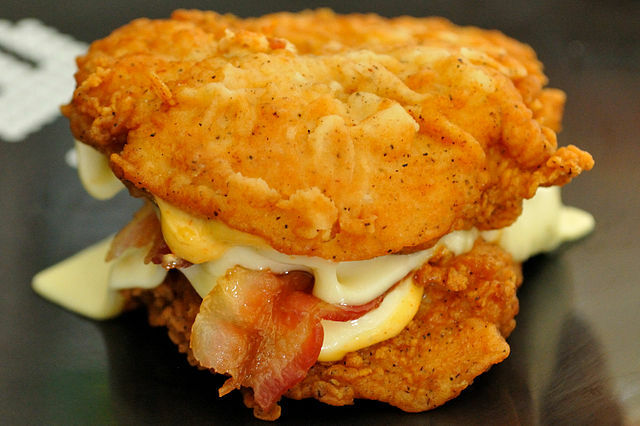 The “limited run” legendary whipping-boy sandwich from KFC called the Double Down is back after a multi-year hiatus, to the chagrin and delight of the Internets. When first unleashed in 2010 the Double Down was the scorn of nutritionists and the bane of foodies alike – a strange alliance given that the two camps are often at odds over concepts they believe cannot exist together like “health” and “deliciousness”. The vitriol from both was rather frothy. Made from three sort-of straightfoward ingredients (if you get the grilled chicken option instead of fried and skip the sauce): chicken, cheese, bacon. I’m pretty sure I don’t have to tell you what kinds of awful go into making sandwich buns at fast food joints (like dough conditioners also used in yoga mats). It’s a chicken cordon bleu for $5.49. Yay. The cheese. Likely a frankenish creation that has mere molecules of dairy as an ingredient in order for it to use the word “cheese” in its description. Also source of part of the low-carber’s unwanted carbohydrate grams. The chicken. I won’t even go into the horrors of life as a battery chicken; here I will only talk about nutrition. There ain’t much that resembles what a real chicken should taste like after you’ve raised the birds on soy and antibiotics, injected the meat with saline, and then slathered it in a crusty spice layer (which includes wheat, according to KFC’s website). I’ll stop there. It’s a chicken cordon bleu for $5.49. Ick. Interestingly, even with a bit of nutrition education, I (just like the rare blogger back in 2010 who said Double Downs were not the most evil thing they could imagine) would put the Double Down far ahead of many, many things recommended by the likes of Eat This, Not That and their ilk. I do give some kudos to that series’ desire to allow folks to make incremental changes from where they are now in their habit. However, I think their “evil” list is misguided, namely in their rote avoidance of saturated fat, sodium, and cholesterol. So where does this leave us? My dude and I (mostly him, OK) tested out a real Double Down, for science. It was breaded and weird. It was not at all like the “extra tasty crispy” stuff you expect from KFC. The cheese didn’t have time to melt, the sauce was unnecessary if they’d only use bacon with flavor…. but…. it didn’t make us throw up in our mouths. So, good job, KFC?